If Obama can't stand up to Iran and Israel, he will set the US on a direct path to another Middle East war. US Secretary of Defense Leon Panetta made some perhaps unintentionally interesting remarks regarding US policy toward Iran earlier this month, and it is fair to suppose that the venue in which he made them was not accidental. Each year, the Brookings Institution, a prominent US think-tank, hosts the Saban Forum, a gathering of US and Israeli officials, along with the usual retinue of journalists, academics and observers, to discuss issues of common interest and concern. This year's theme was "Strategic Challenges in the New Middle East", and participants sought to focus thought and discussion, in the Saban Centre's words, "... on historic shifts... and their implication for US-Israeli security and interests in the Middle East region". Of course, the tacit assumption that US and Israeli interests in the region are somehow mystically conjoined is an increasingly dangerous one, and a fallacy that the Saban Forum, like other such Washington confabs, does much to promote. Other "strategic challenges" in the Middle East notwithstanding, the threat posed by Iran's apparent pursuit of nuclear weapons hung like an incubus over this year's proceedings, and in addressing those concerns in his keynote speech, Secretary Panetta delivered the sort of mixed message which Israeli officials have come to expect from the Obama administration. Standing before huge Israeli and US flags, the secretary delivered prepared remarks in which he strongly asserted that "determination to prevent Iran from acquiring nuclear weapons" was one of three "pillars" of US policy in the region. And while he extolled the importance and encouraging efficacy of diplomatic and economic sanctions, and carefully noted that resort to military force must be a last, and not a first option, Panetta also pointedly stressed that the administration had "not taken any options off the table". His department, he said, would be charged with preparation of a military option if so requested by the commander in chief, and would not shrink from doing so. All in all, it was a vigorous, straightforward restatement of administration policy, designed to reassure an Israeli audience. But in response to questions, the defence secretary said perhaps more than he intended, revealing more of the administration's true thinking than would have passed muster in his cleared remarks. A military strike on Iran, he said, would not destroy Iran's nuclear ambitions, but only delay them - perhaps a year or two at best. The relevant targets, he added "are very difficult to get at". And against such limited and tenuous gains, one would have to weigh some daunting unintended consequences: a regional backlash which would end Iran's isolation and generate popular political support for its clerical regime both at home and abroad; attacks against US military assets and interests in the region; and "severe economic consequences" - read: sharply increased oil prices - which would undermine fragile economies in the US and Europe. Finally, he said, initiation of hostilities could produce "an escalation... that would not only involve many lives, but ... could consume the Middle East in a confrontation and a conflict that we would regret (emphasis added)". Hardly a ringing call to arms, that. William A Galston, a Senior Fellow at Brookings who attended this year's Forum, has written perceptively for The New Republic about Israeli reactions to it. Apparently, the studied ambiguity which the administration is attempting to maintain regarding its willingness to employ military force against Iran is not having the intended effect on its chosen audience - which is not the Iranians, but the Israelis. According to Galston, among the many Israelis of differing political stripes with whom he spoke at the conference, no one - not one - believed that the Obama administration would ever exercise a military option to prevent Iranian acquisition of a nuclear weapon. Obama, they have concluded, is wedded to a containment policy; if Iran were nonetheless to acquire a nuclear capability, they are convinced, his administration would reconfigure its containment policy to suit. As Galston points out, this is completely unacceptable to the Israelis. For them, a nuclearised Iran poses an existential threat which they - unike the Americans - literally will not tolerate. This fact is recognised within the administration, and particularly within the US Department of Defence, with which potential hostilities with Iran, however initiated, would be its responsibility to deal. No one really paying attention should be surprised by this. Just days before the Panetta speech at Brookings, General Martin Dempsey, the US chairman of the joint chiefs of staff, gave a notable interview in which he made clear that, while the US sees sanctions and diplomatic pressure as the prudent course to pursue vis-a-vis Iran, "I'm not sure the Israelis share our assessment of that. And because they don't and because to them this is an existential threat, I think probably that it's fair to say that our expectations are different right now." Asked whether he thought Israel would inform the US before striking Iran, Dempsey responded, "I don't know." That is political-military speak for "No". In short, current US policy, as the Israelis understand it - and as opposed to how it is being articulated by the administration - is unacceptable to Israel. This is no doubt troubling to them, but not a grave concern, for two reasons. 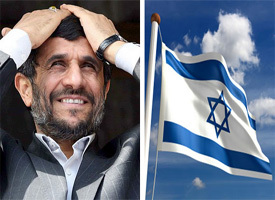 First, the Israelis need not rely on the US to initiate hostilities with Iran, if it should come to that. They can do so themselves, confident that the US will then be forced to deal with the consequences, including the Iranian retaliation which Panetta described and all would expect. Secondly, and perhaps more importantly, the Israelis know that they can pursue such a course, in extremis, without serious fear of repercussions, including a cutoff of US support - diplomatic, military, or otherwise. They know that, where Israel is concerned, policy is not made in the White House, and still less at the Pentagon. It is made in Congress, which stands in thrall to Israel. Remember, this is an administration which thought it could pressure Israel into abandoning its illegal settlement programme and making a just peace with the Palestinians; it has since been taught a political lesson which it is unlikely to forget. And so, in this as in all other instances, the White House, bereft of effective sticks, is reduced to importuning the Israelis, trying to convince them of the seriousness of US purpose in confronting Iran and the effectiveness of its current sanctions policy, while hoping against hope that the Israelis would not take the sort of precipitate action which all would eventually come to regret. In making its case to the Israelis, moreover, the White House' domestic political position is being further weakened by its own rhetoric. The president and senior administration officials know that Iran does not pose an existential threat to Israel, and that the Iranians are anything but impervious to the overwhelming nuclear retaliatory threat which Israel poses. In fact, the Iranian drive for a nuclear weapons capability has relatively little to do with Israel, and much to do with the threat posed by Washington, whose ability to intervene at will in the region with overwhelming conventional force has been amply demonstrated three times in the past 20 years. The White House dares not say this, however, lest it convey weakness to Iran and a lack of resolve both to Israel and to its political critics in the US. Indeed, Secretary Panetta was back at it in his address to the Saban Forum when, after making reference to Iran's support for terrorists, he asserted that "... a nuclear weapon would be devastating if they had that capability". Having hyped the Iranian threat incessantly for the past three years, asserting that an Iranian nuclear weapon would have devastating and unacceptable consequences for US interests, the administration has put itself politically in a position from which it cannot escape on its own. The president's Republican adversaries are parroting the same rhetoric, and fairly slavering at the chance to brand him as soft on the Iranian threat; even his Democratic colleagues would quickly abandon him if forced to make a choice, as the recent Senate vote on toughening Iran sanctions, which went considerably further than the administration wanted, has made clear. Thus does Obama find himself effectively in a corner. He has bet everything on the efficacy of a sanctions policy toward Iran, and while it may succeed, very few experts believe it can. The putatively most powerful man in the world is now hostage to the whims of Israel and Iran, foreign countries neither of which he can control. Unless one of them chooses to release him, there is no way out save moving forward, on a direct path to war. Robert L Grenier is chairman of ERG Partners, a financial advisory and consulting firm. He retired from the CIA in 2006, following a 27-year career in the CIA's Clandestine Service. Grenier served as Director of the CIA Counter-Terrorism Centre (CTC) from 2004 to 2006, coordinated CIA activities in Iraq from 2002 to 2004 as the Iraq Mission Manager, and was the CIA Chief of Station in Islamabad, Pakistan, before and after the 9/11 attacks. Previously, he was the deputy National Intelligence Officer for the Near East and South Asia, and also served as the CIA's chief of operational training. He is credited with founding the CIA's Counter-Proliferation Division. Grenier is now a life member of the Council on Foreign Relations, and speaks and writes frequently on foreign policy issues.